It doesn’t make Alan Brookes different that he’s constantly connected to his customers, prospects, and business associates by social media and email. Go to the corners of the Earth, and you’ll find that almost everyone today is plugged in and online through their computers, tablets, and smartphones. Being successful in this day and age means staying connected. What makes Brookes different is that all of his written communications are run through an assistant who checks them for tone, accuracy, spelling, brevity, and lucidity. Mr. Brookes discovered a new breakthrough in email editing technology that employs real, human editors to promptly and proficiently review all of his outgoing emails, called Wordzen. The service is an add-on for Gmail accounts that allows users to send outgoing emails through the Wordzen editors, who work 24/7/365 to ensure that each message is perfectly crafted. In very short order, users write or record their message, hit “Wordzen,” and the message is sent to an editor for review. The revised content is then deposited as a Draft into the user’s account or sent on to its intended recipient, depending on the user’s set preference. The whole process is seamless and swift, and improves productivity up to 90%. And that might not even be the best part. Not only does Wordzen make him appear more eloquent and articulate than the average email writer, Brookes comments, it has given him a real edge in several business negotiations. 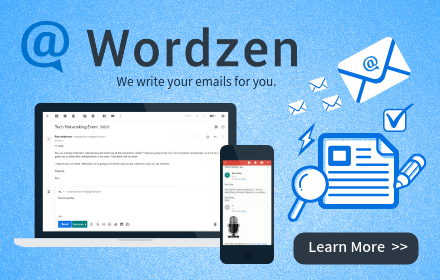 However, you don’t have to be working multi-thousand-dollar deals to use Wordzen. In fact, it’s applicable across all industries. From catering to engineering, marketing to real estate, law to NGOs, tech to environmental, our users come from all walks of life and use Wordzen as it best suits them. For a monthly subscription, you can save up to 90% of the time you spend writing and responding to email and be confident that each message will be perfectly crafted to suit your needs and present you as intelligent, polite, funny (if the time is right), and authentic — the perfect professional. *Quoted comments are from actual users, but names have been changed to maintain their privacy. New Feature: Should I Save or Send?